Oikoumene Ministry of God (OMG) is a Christian fellowship of Esa Unggul students who are one of the Student Activity Units in Esa Unggul. 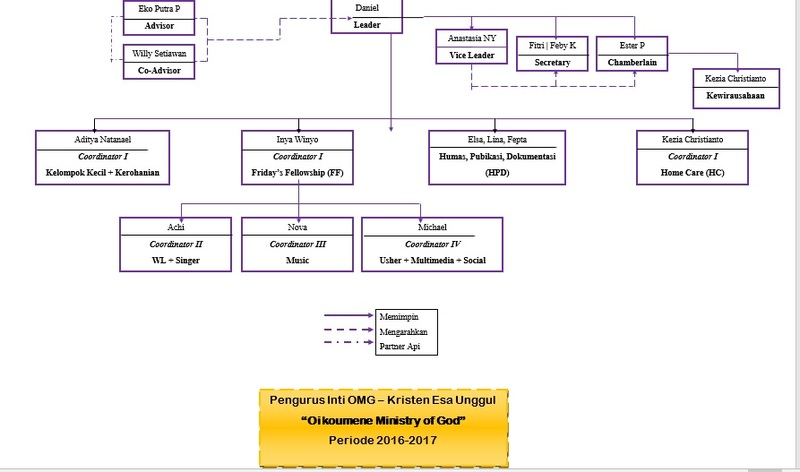 OMG was formed in 2011 by several students at Esa Unggul who have a longing for Christian students who are allied together in a community to both know God and grow in His Word and love one another. From the initiative of several students, a Christian student community was formed under the auspices of Esa Unggul Student Executive Board (BEM). OMG is built on biblical Christian values ​​and emphasizes the unity of the Lord’s churches (Oikoumene). OMG is interdenominational, meaning that this fellowship does not adhere to certain church denominations, so that Christian students of any denomination can join this fellowship. OMG has a vision of “Be a Christian Sample based on Christ’s Righteousness in Friendship and Community”. Activities in OMG include Friday Fellowship, Bible Teaching, Home Care, and others.